Join us April 6th 12-5 pm to celebrate the release of our final homes! Join us April 6th 12 -5 pm for small bites, refreshments and giveaways as we celebrate the release of our final homes! Get the townhome you love, at the price that fits your budget. 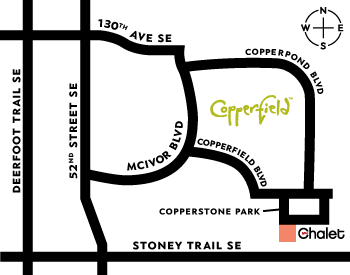 Copperfield Chalet is releasing its final townhomes, plus limited-time, new lower pricing from $ 275K + GST! You’ll love our single-and double-attached garage townhomes, which range in size from 1,132 sq. ft. to 1,422 sq. ft., and come complete with two or three bedrooms, spacious ensuites, designer interior finishings, window coverings, 9’ main floor knockdown ceilings, stainless steel appliances, and so much more! Need directions or want to talk directly to our Chalet team? ** Conditions apply. Prices subject to change or cancellation without notice. Please speak with any Chalet sales associate for complete information.